If you are looking for a supplement able to make your weight loss effort one level more efficient and effectively boost your energy, Hi-Tech Pharmaceuticals StimerexEs is right for you. This unique nutritional supplement contains both 25 mg of powerful Thermo-Z brand ephedra extract and phenylethylamine alkaloids extracted from Acacia rigidula species. The formula that includes these ingredients works for you to achieve one objective – to help you lose more weight. 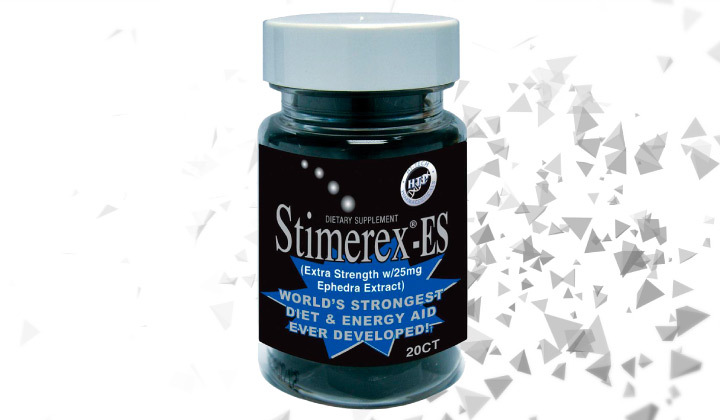 The Hi-Tech Pharmaceuticals Company formulated Stimerex as a Dietary and Energizing Nutritional Supplement for you to get perfect results and it most certainly works! Where to buy Stimerex-ES ? The supplement contains Ephedra Extract which powerfully stimulates the cerebrospinal nervous system, enhances your energy and physical performance, as well as sharpens your focus and concentration. The Caffeine Anhydrous compound helps you suppress your appetite, has a mild diuretic effect, and makes your mind alert and focused. The extract derived from Acacia Rigidula will help bodybuilders suppress their appetite, promoting fat breakdown processes. Green Tea Extract enhances your mental alertness and thinking abilities. Methylsynephrine brings your body into a thermogenic condition. Theobromine dilates your blood vessels, promoting better blood flow. Yohimbe Extract boosts your well-being and overall mood, suppresses your appetite, as well as ensures your better libido and sexual performance. It’s recommended to take 1 tablet three times a day. Never exceed 4 tablets within 24 hours.